Recipe of 'Moru Kachiyathu' – Kerala special is given here. 'Moru Kachiyathu' is one among them which is an unavoidable dish of people in Kerala and is a main recipe of all houses along with rice. In this article you can learn the method of preparing the delicious moru kachiyathu easily in your house itself. Try it and you cannot stop making it. Kerala is famous for the different and unique varieties of curries. 'Moru Kachiyathu' is one among them which is an unavoidable dish of people in Kerala and is a main recipe of all houses along with rice. The combination of rice and kachiyamoru has a dynamic effect on people. Some people are craving to have it and do not like any other dish or combinations. Even though it is a simple dish, it's taste can influence anyone. This can be kept for 1 day and it will become even better when time passes. Indian curd is more preffered than yogurt. Moru was traditionally prepared using coconut paste, but this curry without coconut is every people's favorite these days. It is a special curry which is very easy to prepare and even helps us to overcome the heat of summer season. It looks yellow in colour and has slight sour taste which makes it tastier. In this article you can learn the method of preparing the delicious moru kachiyathu easily in your house itself. Try it and you cannot stop making it. Grind all the above ingredients together. First wash all the necessary ingredients and keep them aside. 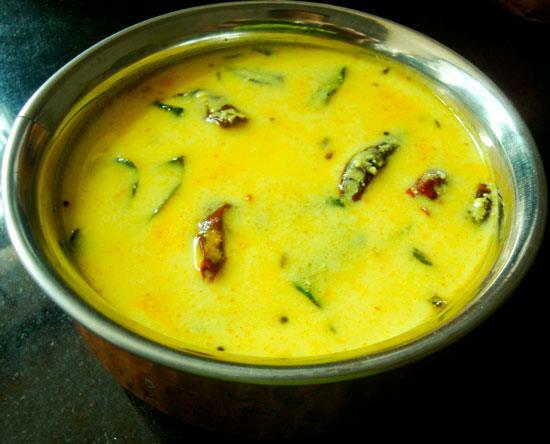 Soak curry leaves in butter milk. Heat the coconut oil in a large pan and add sliced onion, broken red chillies, mustard seeds, fenugreek and curry leaves. When seeds crackle, add ground ingredients along with slit green chillies and sliced ginger. Stir it well for few minutes. Now add butter milk and salt to taste. Start cooking it without allowing to boil till steam starts rising. Stir it properly all the time so that all the ingredients will mix fully. Finally when it is ready, remove it from fire and stir occasionally till it cools. When its temperature reaches moderate level, then you can serve it. This 'kachiya moru' is used as curry along with rice and is one of the special and tasty curries of Kerala.